What could be spookier than Winnie’s dark mansion? Her dark haunted mansion, that’s what! 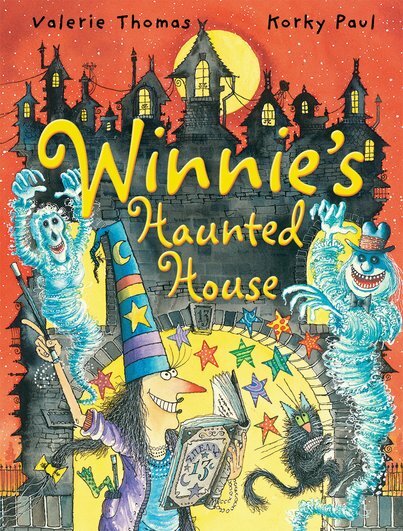 A naughty ghost is on the loose in Winnie’s house. It’s smashed the vase and torn down the curtains. How can she get rid of it? No problem. With a wave of her wand, Winnie banishes the ghost… Oh, hang on. Oops! Instead, she fills the house with skeletons, ghouls, spiders and bats. It’s total spooky mayhem! Question: why does scaredy-cat Wilbur look so pleased about it all? this is a good book! though I thought maybe you could make these kind of books for year 6 and 5 years in primary? but any way this is a great book!